Q. Everyone who tries to clock in or out at our Vetro clock comes up "Invalid ID." Our clock is on our local area network. What should I do? A. It sounds like your employee profile information needs to be sent to the clock. Start Clock Manager by clicking on the "Setup" menu in TimePilot Central and choosing "Clock Manager." Move your cursor over the image of your clock in Clock Manager and right-click it. In the menu that pops up, choose "Network Functions" and then "Send User Setup to Clock." When the process is complete (it should just take a few seconds), here's how to check to see that the information has been sent to the Vetro clock: At the clock, press 99 and OK and enter your password. At the Administration menu, select Option 4 and you can scroll through the clock's profile list. If your clock wasn't on a network, you'd follow the procedure described in the first paragraph, but instead of choosing "Network Functions," you'd choose "USB Functions." Next, click "Transfer Employee Setup" and follow the instructions that appear. Q. Is it possible to generate a report showing which times have been manually changed by our payroll person, for instance if they adjusted an employee's work hours? A. Yes. If you run a "Transaction Report (Comparison)," you will see a column with the header "Mod" (it stands for "Modified"). A checkmark in that column indicates that the transaction has been modified. Q. When entering employee hours manually, TimePilot Central is not calculating the time and there are Xs in some of the boxes. What are we doing wrong? A. When the software detects a missing clock-in or clock-out, it's impossible to properly calculate the time. (For example, how many hours did Mary work if she clocked in on Monday at 8 a.m., forgot to clock out, and clocked in Tuesday at 8 a.m.?) This is one reason you will see an X in the column. If you click on an employee's name, you can see all of their transactions. In the first column, you should see alternating red arrows (indicating a clock-in) and blanks (indicating a clock-out); but in this case you'll probably see one place where there are two successive red arrows or two successive blank spaces. That's where the required clock-in or clock out was forgotten. To fix this, use the "Insert IN" or "Insert OUT" buttons at the top of TimePilot Central to insert the missing transaction. Once TimePilot has the required clock-in and clock-out pattern, the X's should disappear and the employees' hours will be displayed. Fast or slow? : By observing how quickly bank tellers made change, pedestrians walked and postal clerks spoke, psychologists determined that the three fastest-paced U.S. cities are Boston, Buffalo, and New York. The three slowest? Shreveport, Sacramento, and L.A.
Mountain time: There’s a giant clock designed to last 10,000 years being built in a mountain in West Texas. Funded in part by a $42 million donation by Amazon founder Jeff Bezos, the clock will be hundreds of feet high. The project is sponsored by the Long Now Foundation, and involves Whole Earth Catalog creator Stewart Brand and rock musician/composer Brian Eno. “Ideally, it would do for thinking about time what the photographs of Earth from space have done for thinking about the environment,” said Brand. Every month we'll offer news about TimePilot products, tips on how to use them more efficiently, some of the "cool stuff" our employees have come across. TimePilot Q&A: What to do if you see "Invalid ID" or an "X" where an employees' hours should be. TimePilot Lead Story: Job Costing: Keeping Track of Individual Tasks. This article is excerpted from a report on how to use your TimePilot system for "Job Costing." For the complete report, with screenshots and much more detail, click here. Your TimePilot system can also be used for keeping track of the time taken by particular jobs. Commonly known as “job costing,” this feature can be used to determine the amount of time an individual project takes during the workday or how long an employee takes to complete a particular project. Let’s say you run a remodeling company and use TimePilot Extreme Blue Enhanced (although the principles described below apply to any TimePilot timeclock system that uses the TimePilot Central software). In a single shift, your employees might be doing framing, then putting up drywall, then painting—and one employee might be doing some plumbing, too. TimePilot’s job costing feature allows you to see how each employee spent his or her day and also to determine how much time all employees spent framing, drywalling, painting and plumbing. To do this, each employee will carry a black iButton and several others of different colors. The black iButton will be used to clock in and out at the start and the end of the day for payroll purposes; the color iButtons will be used to record the start time and end time of particular jobs or tasks. For instance, when an employee starts framing, he or she would tap their yellow iButton to the Extreme Blue clock’s “In” probe. When finished, they would tap the yellow iButton to the clock’s “Out” probe, then tap their red iButton to the “In” probe to indicate they are starting drywalling. Here’s an explanation of how a remodeling company with four employees—Ben, John, Mary and Tom—already using TimePilot for payroll purposes would use the system to keep track of the time their employees spend in framing, drywalling, painting and plumbing. At the Extreme Blue clock(s), employees clock in for the day with their black iButtons, and then after being assigned their first task of the day, clock in for that job with the appropriate colored iButton. When they’re finished with the job and are moving to another task, they clock out of the first job and clock in the second with the appropriately colored iButtons. When the workday is done, they clock out of their last job with the appropriately colored iButton and then clock themselves out for the day with their black iButton. 7:58 a.m.: John arrives at the site and clocks in for the day with his black iButton. 8:02 a.m.: John is assigned to framing until 9:30. He taps his yellow iButton to the clock’s “In” probe. 9:30 a.m.: John taps his yellow iButton to the clock’s “Out” probe. His next task will be plumbing, so he taps his purple iButton to the “In” probe. 12:10 p.m.: It’s lunchtime: John taps his purple iButton and his black iButton to the “Out” probe. 12:55 p.m.: Lunch is over, but John still has some plumbing to finish. He taps his black iButton and his purple iButton to the “In” probe. 1:30 p.m.: Plumbing work done, John taps his purple iButton to the “Out” probe. Now he’s on to drywall, so he taps his red iButton to the “In” probe. 5 p.m.: John’s workday is over. He taps his red iButton to the “Out” probe, then taps his black iButton to the “Out” probe to clock out for the day. John worked for 9.28 hours (he’s not paid for his 45-minute lunch). John spent 1.47 hours framing. John worked on plumbing for 3.25 hours. John spent 3.5 hours drywalling. We suggest posting a notice at the timeclock to remind workers which color iButton represents which task. The next time you collect your employees' hours from the clock, all the job costing data will collected too. To learn how to set up Job Costing as well as how to analyze the data you collect, see our full report on the topic. Click here. You may have seen the walls of yellow lockers appearing outside gas stations, shopping centers, grocery stores and even at colleges and universities. They're a new Amazon service: Amazon Locker. Let's say you've ordered something from Amazon, but you're afraid it might get stolen from your front porch or apartment house vestibule after delivery. Just have the package delivered to a nearby Amazon Locker. Amazon will send you a code so you can open the locker and retrieve your package. Or let's say you want to return an Amazon purchase. 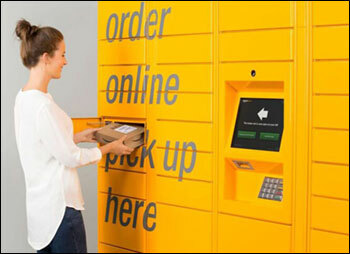 You can go through the hassle of returning it by mail or delivery service, but often an easier option is to drop it off at a nearby locker. When you get to the facility, just enter the code Amazon gives you when you set up your return online and a locker will pop open. Put the package in the locker, close the door and you're done. They're open 24 hours a day and 365 days a year, and there's no additional charge to use them. © Copyright 2017, TimePilot Corp. All rights reserved.